Lowepro CompuDaypack is a backpack which can accommodates a notebook computer or laptop computer, and a digital SLR with lens attached (up to a 105mm f/2.8), plus 2-3 additional lenses or flash units. Beside, there is upper compartment for personal accessories and cables, and quick access front pocket for MP3 player or mobile phone accessible through the unique headphone port. DigitalCameraReview reviewed Lowepro CompuDaypack Notebook & Camera backpack and concluded that if you’re looking for a reasonably priced notebook/camera backpack, you should definitely take a look at the Lowepro CompuDaypack. It can handle a notebook and camera load perfectly in a slim size that will fit easily under an airplane seat. 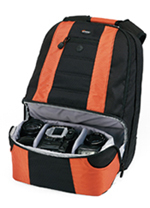 The high quality products from Lowepro are backed up with their limited lifetime warranty.